Two ladies from Crawley who’ve stood on the side lines for years have just qualified as FA level One coaches. 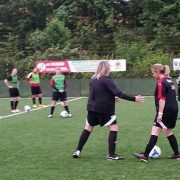 Carol Bates and Maria Iula Harris are from a generation of women that missed the female football revolution but thanks to the EFL Trust FFD programme they’ve taken up the sport later in life. They were introduced to football by Crawley Town’s COGS (Crawley Old Girls Initiative), which was developed specifically for older ladies, who have an interest and passion for football, but who may not have had the opportunity to participate before. In addition, the ladies have used their newly developed skills recently to help deliver a session to the rest of the COGS ladies, supporting grassroots football. Nicol Mererdith from the EFL Trust commented: “It’s really fantastic that the COGS ladies have had this opportunity. 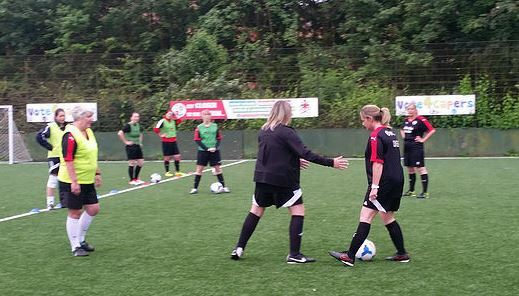 Our FFD programme has certainly been a catalyst for women now taking the level 1 award. It’s evident that this will further develop the workforce, and create role models for future generations”. The grant of £2000 from Crawley Town FC and the FA Community Shield Fund, allowed six young people as part of the Crawley Town Scholarship Fund to complete the FA Level 1 Award in Coaching at the Checkatrade.com Stadium. Delivered by Sussex County FA, attendees worked on various different modules to prepare them for coaching activity with the Community Foundation.